It was another score today, 2nd Feb, 2019, for IPOB in Orlu province as Oguta LGA IPOB family members took the referendum message to the Biafrans in their LGA. They expressed joy that finally a date has been picked for Biafra referendum. Mazi Chidi Nwachukwu who led the rally in company of Mazi Okezuonu, the Oguta LGA coordinator took time to explain to the people that Biafra referendum date is the best day to conduct the kind of referendum that suits the African system of governance. He stressed that IPOB high command intelligently chose the day. Explaining further, he said that Biafra referendum is a simple sit-at-home exercise. By sitting at home on that Nigeria election day, the world would observe and record our resoluteness to have our own sovereignty. 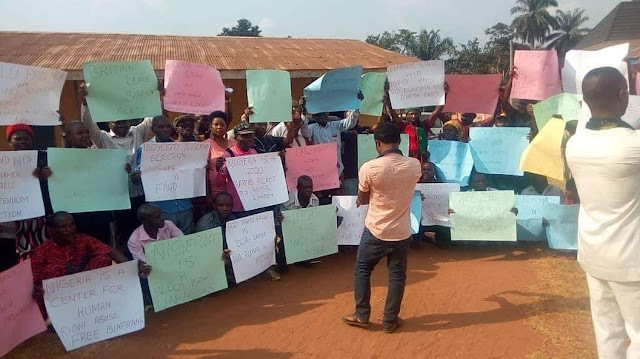 Mazi Okwuosha, the Orlu mobilization officer urged the people to obey the sit-at-home directive, explaining that life will have its real meaning if we have our own sovereignty. This expression led to a quick meeting on how to embark on door to door referendum evangelism to sensitize the people better. Visit to churches by leaders of IPOB in Oguta LGA, open market evangelism and printing of referendum posters were among many strategies adopted by IPOB Oguta LGA members to spread the message. During that brief meeting, Mazi Chidiebere Nwosu presented his new referendum musical album to the members. He sang, and they all danced in expression of joy that great Talents are found among them. The album titled 'election boycott' has just two tracks but very rich and is a better material for IPOB evangelism. Recall that IPOB, led by Onyendu Mazi Nnamdi Kanu chose 16th of February, 2019, the very day for Nigeria presidential election as Biafra referendum day.